Commissioning and periodic on-site maintenance checks are crucial and often prescribed for safe and uninterrupted operation of power transformers and substations. 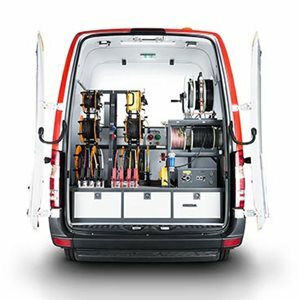 A unique combination of routine electric tests and advanced diagnostic techniques are gathered within the dedicated “Megger Transformer Test Van” to help you reduce testing time and prevent accidents. Deterioration of electrical insulation can be identified by high voltage insulation tests (insulation resistance, dissipation factor and capacitance measurement, dielectric frequency response). Mechanical damages due to transport or fault influence, malfunctions or winding shorts are typically found using the frequency response analysis, winding resistance measurement and on-load tap changer tests. Check of ratio, vector group, no-load and short circuit loss is feasible after repairs to guarantee the high quality of maintenance. Oil samples are routinely taken for breakdown tests and gas analysis. All measurements are controlled by a central computer. Most instruments on-board share a common connection to the test object, test circuit arrangement and switching is performed automatically. PowerDB controls the measurement process and records the results. Upon completion of each measurement, results are automatically transferred into a protocol. The software allows calculating the difference between measured values, comparing measurement results with the nameplate and previous tests data.